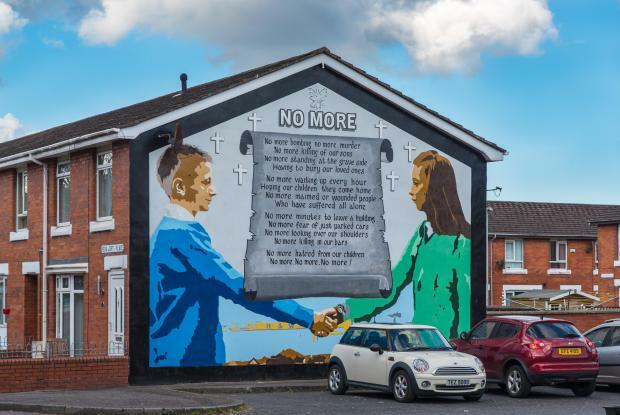 One of the most significant events in my lifetime to date has been the Belfast Agreement of 1998 and the underlying process that brought it about. Pride of place in the publicity around it has gone primarily to a group of men – Clinton, Mitchell, Blair, Ahern, Adams, Paisley, Hume and Trimble to name but a few. Sometimes, it’s as if the Peace Process was a male agenda. Of course, as with so much else in life, nothing could be further from the truth. On the streets, in political parties and movements, in peace and reconciliation projects, in policing and the civil service as well as in schools, churches, unions and primarily homes, women were pivotal. Irish people, North and South owe a huge debt of gratitude to those women. The gift they (and many others) handed to our children and grandchildren is immense. At a recent event in Glasgow, I had the privilege of directly thanking three of them (Avila Kilmurray, Monica McWilliams and former Irish President Mary McAleese) who played a central role in the peace agenda over many decades. Once again, through the medium of this blog and the good offices of Times of Malta, I salute them, their perseverance and their vision. If only it could be matched in the politics of today. Despite having created countless organisations and projects (while simultaneously dealing with much of the pain, heartbreak and fallout from the violence), the ethos and structures of the dominant political parties ensured women were ‘missing’ from the architecture of the peace. Northern Ireland politics essentially left too many women politically ‘homeless’. It became clear that there would be no women at the top table in the talks unless women themselves organised and that they did through the formation of the Northern Ireland Women’s Coalition. Crucially, it included women from all sides and classes. In May 1996 (and within six weeks of the Coalition’s formation), it fielded 70 candidates in elections. Two members were elected, Catholic Monica McWilliams (a university lecturer) and Protestant Pearl Sagar (a social worker). Their slogan - Wave Goodbye Dinosaurs. Disgracefully, as they took their seats at the peace talks, they were booed (and mooed at) by the dinosaurs of Northern Ireland politics including those who are now playing a pivotal role in the Brexit fiasco. As Greta Thunberg, that young Swedish climate change activist commented in response to the New South Wales education minister (who threatened to punish students participating in school climate strikes against global warming) his views and his words ‘belong in a museum’. Alongside all the other ‘dinosaurs’. As we mark International Women’s Day and, for me, women’s role in building peace in Ireland, let us not forget that our political, economic, religious and cultural landscapes are still prowled by such dinosaurs here in Malta and elsewhere worldwide.